Fjallraven Greenland No.1 Down Jacket. Cut from the same (metaphorical) cloth as the original Greenland Jacket that Fjällräven founder, Åke Nordin, first crafted from a piece of durable tent fabric in 1968, the Greenland No. 1 Down Jacket hasn’t lost a step. 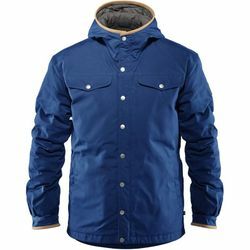 In fact, with traceable, high quality down, wind and water resistant G-1000 Eco fabric made from recycled polyester and organic cotton — this hearty, padded jacket has only picked up the pace. With a fixed hood, handy chest pockets, edging in natural-toned leather around the hood/sleeve cuffs and two hand pockets for warmth on cold days, the Greenland No. 1 Down Jacket can be impregnated with Greenland Wax for that extra protection against wind and rain.